So my comics from small joes arrived today. 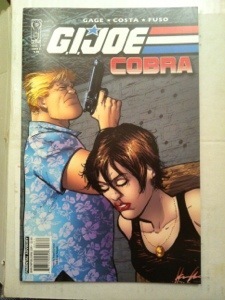 I picked up the entire run of GI Joe: Cobra. The series covering Chuckles as a undercover spy. I thought the first two issues were ok, and developing the story. The third issue, WOW. Chuckles having to kill Jinx blew my mind. Also have a Joe die is something new to me. It was great! I can’t wait to start reading more. Categories: General Joe Stuff | Tags: comics, GI Joe, Leaky Suit Brigade | Permalink.